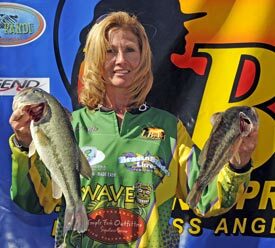 The Lady Bass Anglers Association (LBAA) 2011 Rookie of the Year Pam Ridgle is starting out 2012 with a bang as she earned a hard fought come-from-behind victory on Lake Ray Hubbard. Ridgle?s two-day ten bass total came to 24.27 pounds to put her atop the leader board. Ridgle was in sixth place after day one, but a weather change for day two proved beneficial for the Murchison, Texas resident. ?The wind didn?t blow today and it that allowed me to slow down and fish the way I wanted to,? Ridgle said. ?By 10 AM I had four fish and was looking for the fifth. Everywhere I went, there were other competitors on the spots I wanted to fish. Finally around 1:30 I started culling as I was able to get on a couple spots and let it (the worm) do its thing.? The bait of choice was a Wave Tiki Stick in the New Orleans color rigged wacky style. ?This is something you dream of doing and I?m still in the state of ? I don?t believe this yet,? Ridgle added. ?I know I can fish but when it comes to competitive fishing there are so many things that come in to play. This is just very overwhelming.? Pelham, Alabama?s Kim Bain-Moore finished second with 10 bass weighing 22.69 pounds. Simpsonville, South Carolina?s Martha Goodfellow placed third with 22.41. Robbie Hartline of Foristell, Missouri won the Legend Big Bass Pro Division Award with a 6.83-pounder. ?I caught my big bass in the back of Bay View using a Spro Little John crankbait. The color I was using was Cellmate. It seemed to be a big fish bait,? Hartline added. On the Co-angler side of the Lake Ray Hubbard event, Diane Smith of Fayetteville, Georgia had a huge come-from-behind win to claim her first ever LBAA Co-angler Championship. A remarkable achievement, considering she brought in 0 fish on day one. Weather was also a factor in Smith?s charge from last to first. ?The wind, rain, and waves all stopped today and I could fish slowly like I wanted to, and it made all the difference,? Smith said. Smith?s bait of choice was a Carolina rigged lizard watermelon candy in color. ?This is my first co-angler win with the LBAA and it feels great,? Smith stated. ?This feels even better after zeroing yesterday.? Finishing second at Hubbard in the co-angler division was Diana Uebelhack with 13.78, while Jodi Galloway placed third with 13.64. The Legend Big Bass Co-angler Division Award also went to Co-angler Champion, as smith anchored one of her bags with a 6.78-pound bass.